This is a super easy yet delightfully fresh and flavorful Cucumber Fennel salad that goes great with salmon, white fish, tuna…any fish really. I’ve also served it with chicken and pork before too. The creamy and tangy cucumber dressing is so incredibly simple and it adds such a nice balance to the delicate flavors of the cucumber and anise-like fennel without being overwhelming. You really can’t go wrong with this Weight Watchers salad recipe. It’s also a nutrition powerhouse – the fennel has a lot of fiber, Vitamins A & C, potassium and calcium. And then you get a nice a dose of protein from the Greek yogurt dressing, and an extra boost of Vitamins A, C & K from the cucumber. All for a whopping 50 calories a serving! This cold and crisp Cucumber Fennel Salad Recipe is a must try this summer. A perfect side salad for fish or chicken, this delightful dish is creamy, tangy, and wonderfully fresh. It’s a very simple Weight Watchers salad recipe that offers some great new flavor combinations with the sweet anise-like flavor of the fennel. 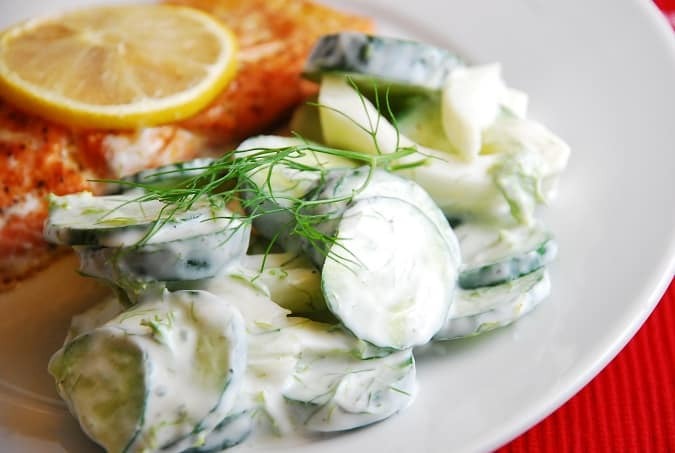 Place fennel, cucumber and dill into a large bowl. In a small bowl, whisk together yogurt, lemon juice, garlic and salt and pepper. Pour over sliced cucumber and fennel, and toss to combine. Does the “serve immediately” at the end of this recipe imperative? I think this would be so good as a packed lunch with a salmon filet, I’m wondering whether it will keep well in a cooler. This is a great idea. The raw garlic is a little spicy for kiddos, as can be the fennel. I am trying without the garlic and scallions instead of fennel next time. Thanks for sharing! Amazing! pinning this and can’t wait to make it… great for this hot spell!